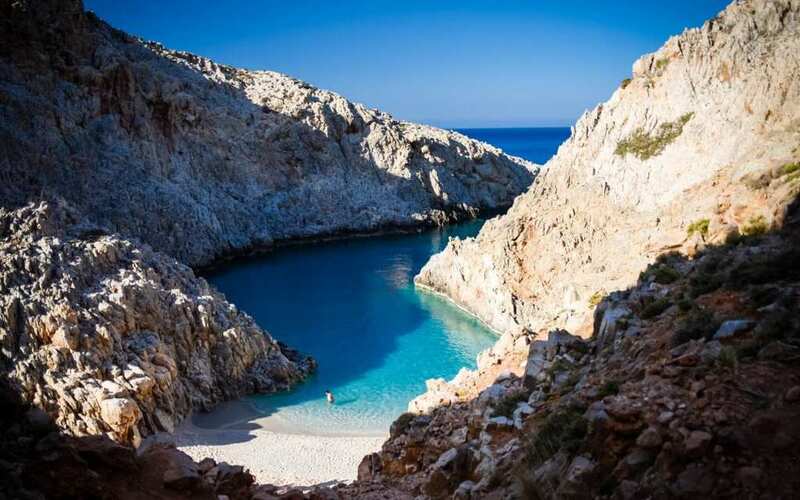 Imagine one of the most beautiful beaches in Greece, nestled in a canyon leading out to the sea. Inside the narrow slip between two cliffs, it has white sand reaching out into turquoise waters that turn to deep blue as it joins the sea. Sounds like a dream? 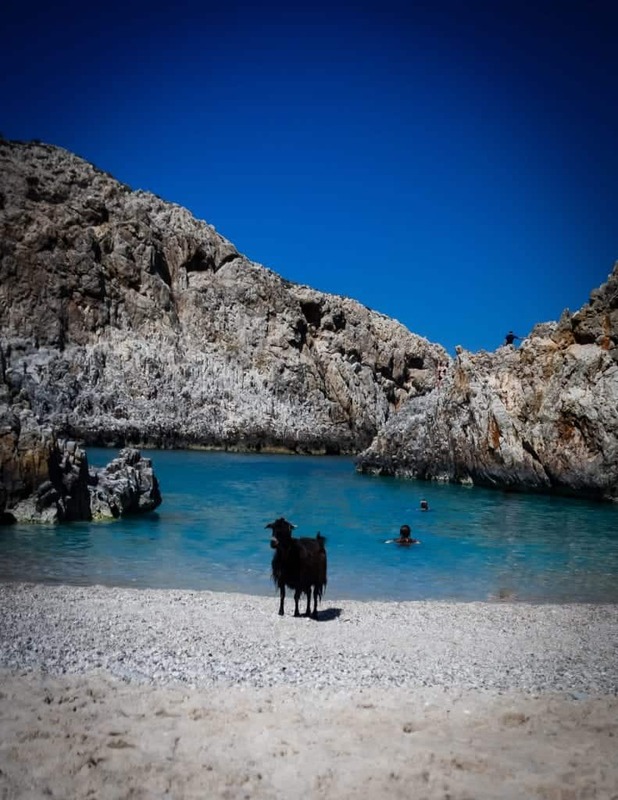 Not quite: it’s just Seitan Limania Beach in Crete. 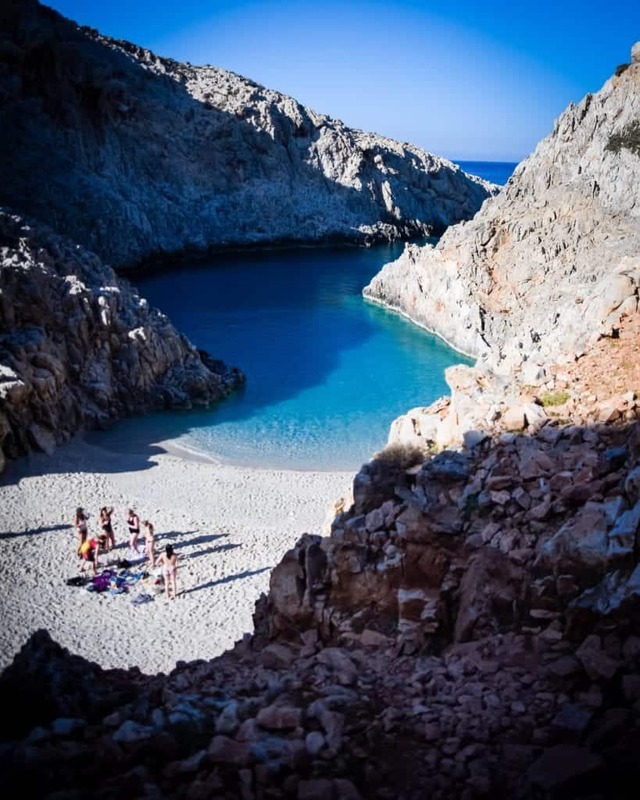 Located just 22 kilometers away from central Chania, this beach is one of Crete’s most beautiful (and the beaches in Crete are some of the best beaches in the Balkans). Luckily, though, it’s not that crowded as it’s one of the more difficult beaches to get to. We went on a beautiful, sunny day near the end of April, before high season began — so I’m not sure how crowded it would be in the peak of summer. There were definitely other people enjoying the beach, but it didn’t feel crowded at all when we went. 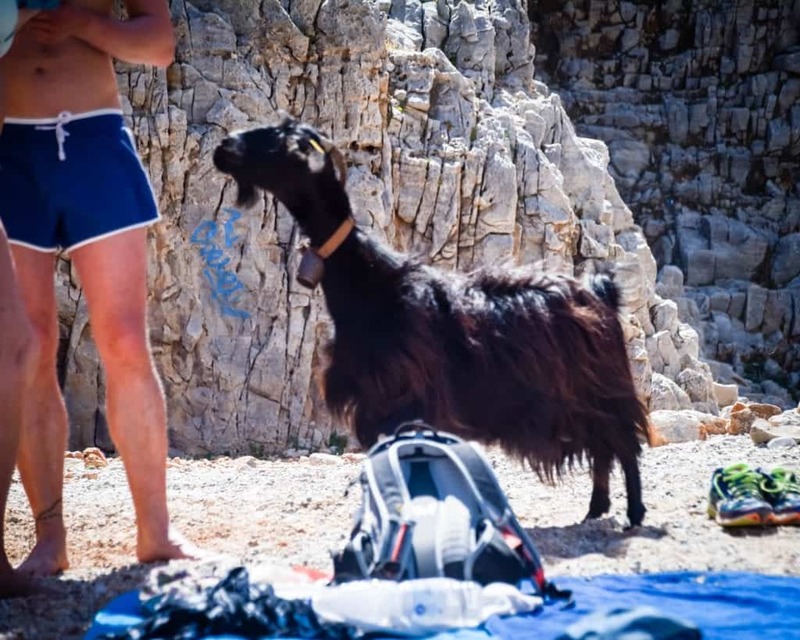 Cliff jumping, goats, and a practically deserted beach. Heaven on earth? Nope, just Seitan Limania. As with much of Crete, your life will be better off if you have a rental car. There is a decent bus network between all the major towns and cities of Crete, but it’s often hard to find a bus that will take you to some of the beautiful beaches and sights in Crete. For example, when we visited near the end of April, there were no buses running yet between Elafonissi (Crete’s pink beach) and Chania. 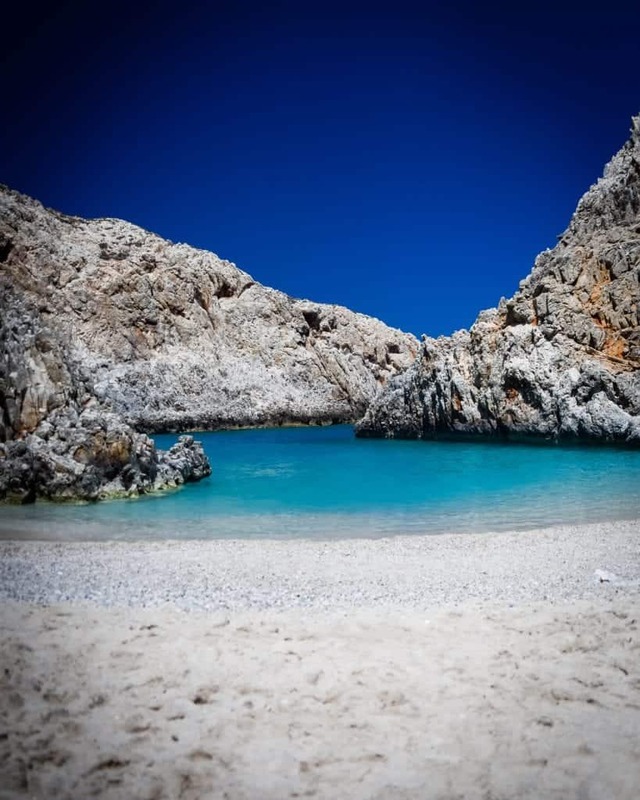 However, if you are staying in Chania and you have a group of people with you (or don’t mind dropping around 80-90 euro roundtrip in taxi costs) it is definitely possible to arrange a taxi service to drop you off and pick you up again at Seitan Limania beach. Our taxi cost 45 euros each way from where we were staying in Kalamaki, about 10 minutes outside of Chania. If you’re in Chania proper, I’d imagine your taxi costs would be about 10-20 euros cheaper roundtrip. The trip takes about 30 minutes to an hour, depending on where in the Chania area you are leaving from and how terrifying your taxi driver is. Be prepared for your heart to jump out of your chest as your car or taxi reaches the final stretch: a series of narrow switchbacks with little room for error. Our taxi driver accelerated after every hairpin turn (despite the fact that we were going downhill down an incredibly steep mountain and there was absolutely no need to accelerate, but I digress…). However, if you’re afraid of heights… the real terror hasn’t even begun yet. See, getting to the parking lot alive is only the first half of the battle. Looking down onto the gorgeous bay below, it’ll quickly dawn on you that you have to get down there somehow. Looking out at the water, there’s a more well-worn looking path on your left-hand side. Paradoxically, that’s not the route you want to take, as it soon becomes basically a cliff. Instead, if you walk towards the beach and veer slightly to the right, you’ll notice a better path down. The hike down takes about 20 minutes if you’re in good shape and aren’t particularly afraid of heights, longer if you’re more afraid or need to take it slower. 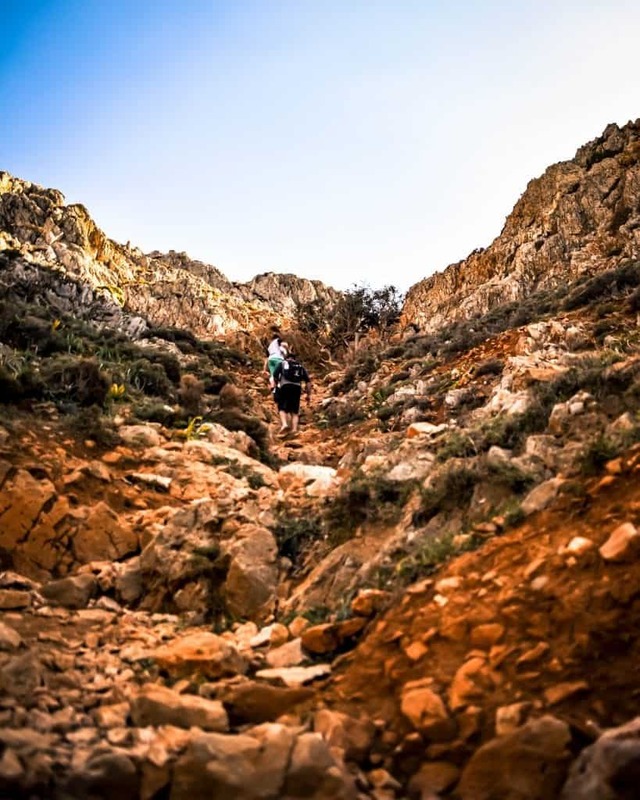 It’s not particularly difficult, but you do have to be careful with where you put your feet, and there are a few spots where it is quite narrow on the way down. 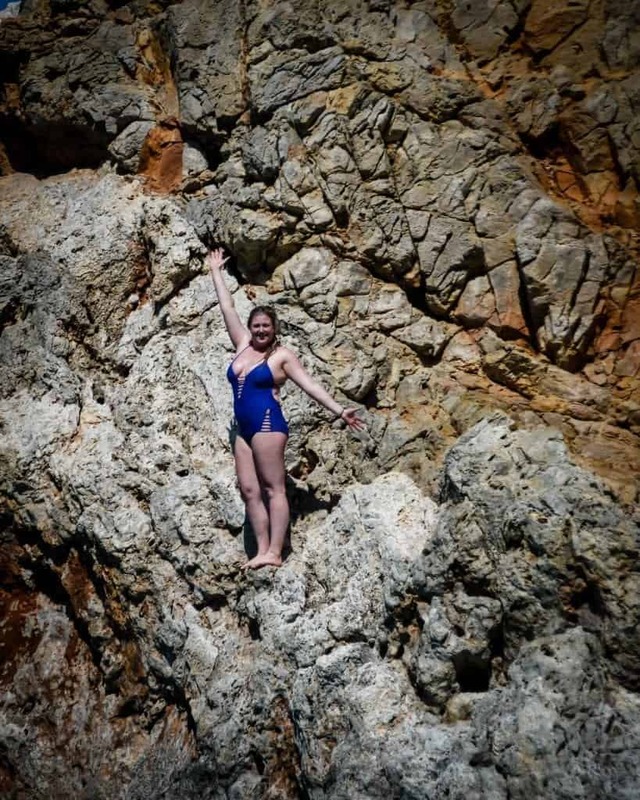 The brave amongst us will keep climbing to do some cliff jumping! 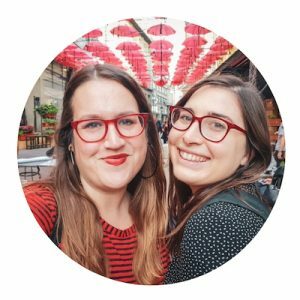 Brave girls! I stayed on shore to photograph. As we arrived at the parking lot for Seitan Limania beach and tried to quell our respective panic attacks and say our thanks to god for surviving our maniacal driver, we heard a peculiar tinkling sound. Turns out it was the bell tied to the neck of a mama goat and her little baby! Adorably, they lead us down the path to the beach, looking back at us quizzically as if to wonder what was making us take so long. 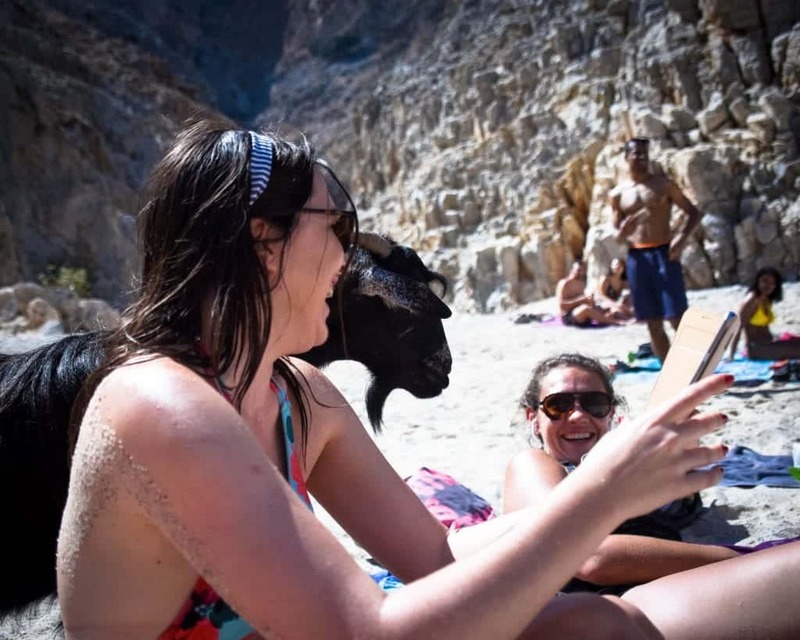 However, once the goats reached the beach, their reign of terror began. The mama goat ended up stealing the food of someone who was swimming and had unsuspectingly left their food unwatched. 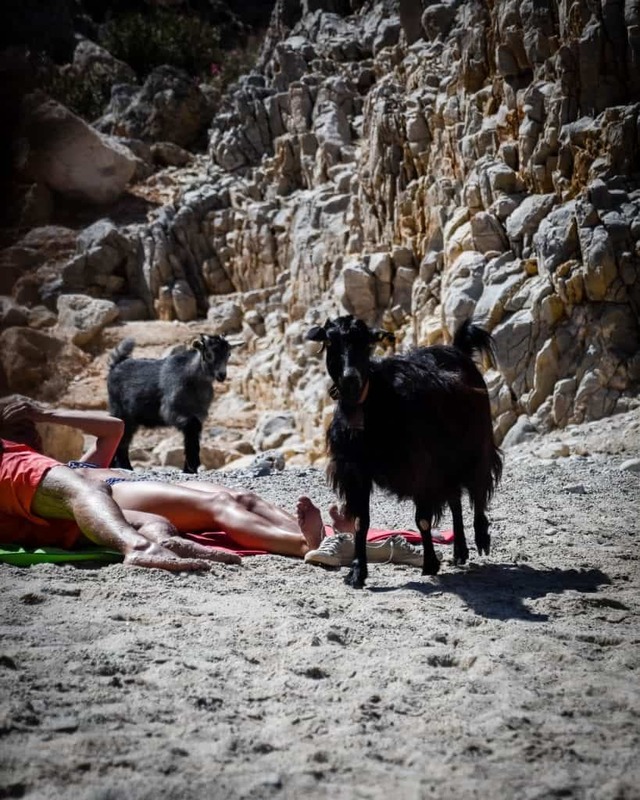 Once she exhausted their food stores, she came for everyone else, unabashedly begging for food while her baby goat watched from the rocks (he didn’t seem to like walking in the sand). 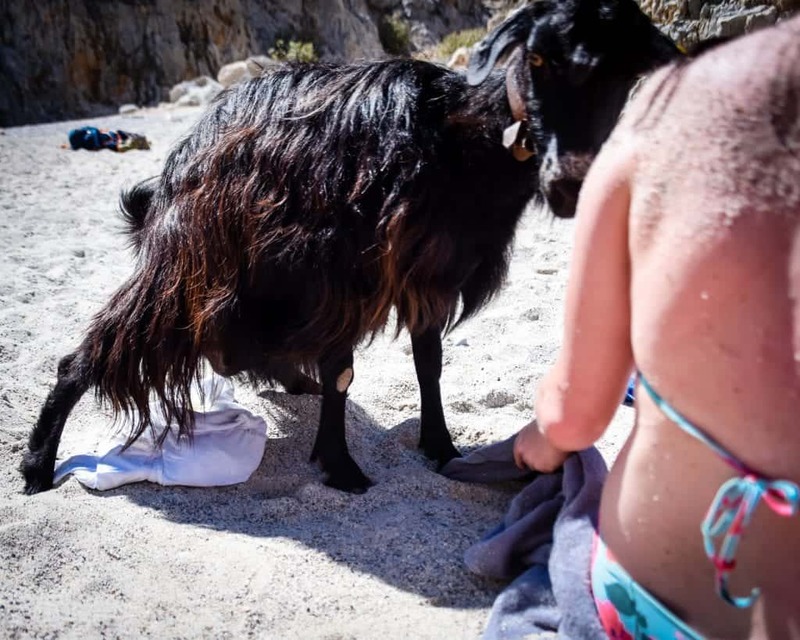 When mama goat made her way over to us, I didn’t feed her as the other people on the beach were doing (I try not to feed animals human food unless I am pretty sure it won’t make them sick. I have no idea what goats are supposed to eat but I’m pretty sure turkey and cheese sandwiches are not it). Instead, I attempted a quick selfie with mama goat. And then she pissed all over my brand new white dress behind me, that I had been using as a pillow in the sand. Here’s a photo of her caught mid-stream. Hiking down the mountain from the parking lot to Seitan Limania is tough, but not impossible, in flip flops. I was wearing Birkenstocks and I was comfortable but would have much preferred sneakers. My friends who were wearing jelly sandals or flip flops had a tougher time. You don’t need hiking boots (though they wouldn’t hurt) but sneakers would be the best bet. There are absolutely zero amenities at Seitan Limania beach… which is part of why it’s so great (and why it’s not that crowded). So, be sure to bring plenty of water (at least a liter per person – and more is better – you’ll need it!) and lots of sunscreen, plus a towel, food, any drinks you want, your headphones or book… basically everything you need for the day. But really, this is all you need. Anything you bring, please be prepared to bring back up with you. There are no trash cans on the beach, but there are garbage bins in the parking lot. Be sure to bring an extra bag to pack up all your waste from the day so you can throw it out once you get back up to the parking lot. Keep Seitan Limania beautiful for those to come in the future! The goats were walking around with such confidence and assurance that I’m sure this is neither the first nor the last time they’ll terrorize Seitan Limania. They will ravage your food if you keep it unsupervised, so be sure to hide it well or have someone hold onto it if you don’t want them to eat all your beach snacks. There is nothing in the way of a toilet at Seitan Limania beach. If you need to go number 1, that’s what the sea is for. All other numbers, please hold. Because the beach is between two canyons, the beach gets darker earlier than other beaches, as soon as the sun sets past a certain point. In mid-April, even though the sunset was around 8 PM, the beach was out of the sun by 5:45 PM. So you’ll probably want to leave about 2 hours before sunset, as your last hours before sunset will not be getting any sun. This may partly be because we went in mid-April, but other beaches we went to in Greece, including more northern beaches on mainland Greece such as Agia Triada, had much warmer water. We were told by our taxi drivers that the water there is always cold because the sun doesn’t really get much of a chance to warm up the water because of the cliffs on either side. Wonderful blog on a beautiful beach! I will be visiting in July and imagine it will be much more crowded, but hopefully the water will be warmer! Lovely pictures with creative, humorous, descriptive, well thought out words! Thanks for the tips – will be sure to bring plenty of water and proper shoes! did you ladies opt for taxi becasue it was far easier, or is thre just no public transportation option to this beach at all??? Hi Keegan, theoretically, there is public transportation from Chania only in the summer season, but we visited in late April so I’m not sure. Let us know if you are successfully able to take public transit and we’ll happily update the article to help future travelers!